If you are trying to get lean or stay lean then you have to eat lean! However, many people don’t realize which cuts of meat are the leanest. Eating low fat and eating the right fats is a key factor in having low body fat. Below you will see the names for the different cuts of meat, where they come from and which ones will help you eat healthy, and get to your goal. 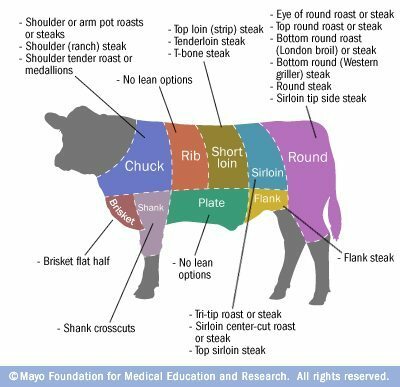 The Mayo Clinic says that there are 29 lean cuts of meat (from a cow). Of these 29, these are thee leanest. Eye opening right!??? Seems as though the leanest cuts of meat come from the rear of the cow. This makes sense since it’s probably the most muscular portion of the cow. When you’re choosing ground beef, look for the leanest percentage of fat. I also opt for “grass fed beef.” Sure, grass fed is more expensive, but it’s worth the extra couple of dollars. My brother calls it a “health tax.” You pay more to be healthy but you live longer. Pay now or pay more for hospital bills later. If you love this information as much as we do then share “which cuts of meat are the leanest” with your friends and family so they can stay healthy and lean.